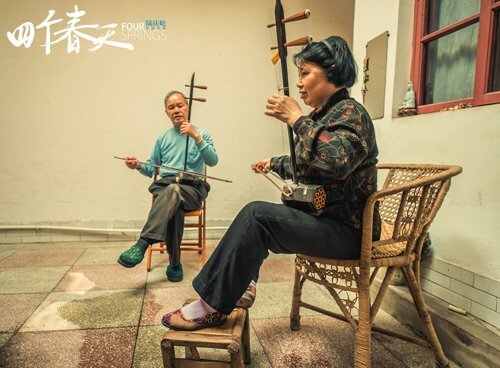 A story about amateur director Lu Qingyi's parents and named after the four springs from 2013 to 2016, documentary Four Springs won best documentary at the FIRST International Film Festival in July of 2018. Now this award-winning film is bringing its touching and warm but powerful story to the big screens across China on Friday. Starting from the Spring Festival of 2013, the director filmed his family's holiday celebrations as his parents, elder sister and brother and himself reunite in a mountainous county in Southwest China's Guizhou Province. With 400 pre-screenings held in 70 Chinese cities from Tuesday to Thursday, the film has moved thousands of people who, just like Lu, work far from home and their parents. Many members of the audience have been calling their parents to express their love for them as soon as the screen grows dark. Lu said that the movie is a tribute to his parents, who he realized from a very early age were very talented individuals, but lacked a platform to showcase their talents. "I wanted to do something for them... every life is a unique experience," he said.